Polarised training - avoiding the grey days of January. | theraceforthecafe.com . Polarised training - avoiding the grey days of January. 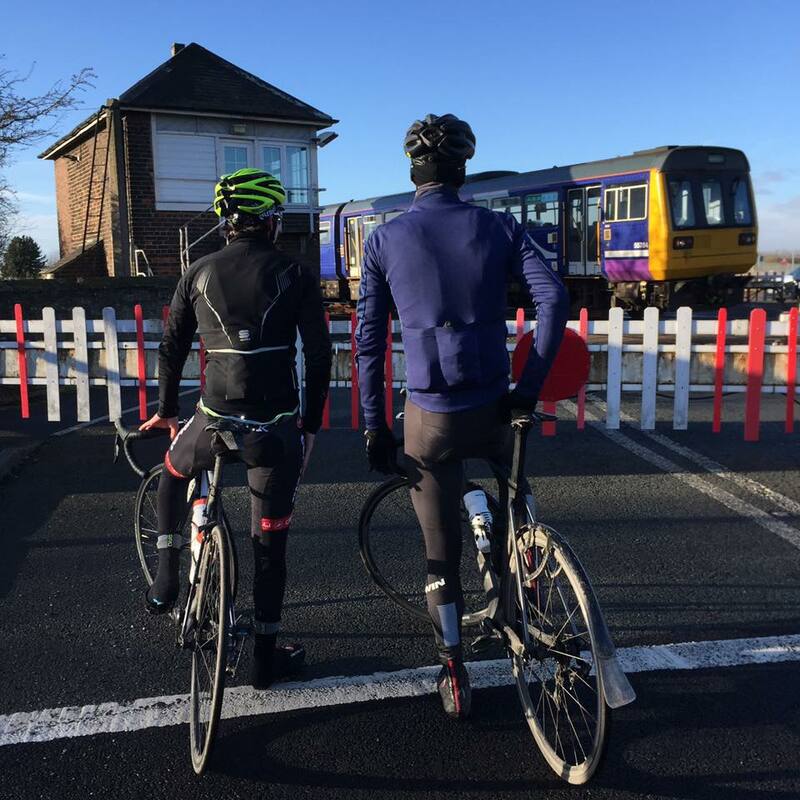 This January I only did two kinds rides, I was either training hard or pedalling gently to my favourite cafe and there was not much in between. Last month I rode 30 out of the 31 days but I definitely didn't train on all of those days and if you look on my Strava you will see that a lot of my rides were around 20 miles at about 14 mph. There was a reason for all those easy rides to the The-Mockingbird-Deli-Yarm and it wasn't just because I like the coffee and company in there. Those easy cafe rides were essential to allow me to recover from some really hard January training days. Another freezing day on Teesside and this is the view I have 'enjoyed' for much of January. Back in the day when I was a multi-sport athlete I followed a blog written by an American triathlete called Gordo Byrn Coach Gordo I was really keen back then and unfortunately trying to emulate Gordo's fairly extreme approach to Ironman training eventually led me down the path of overtraining, although I didn't realise it at the time. This wasn't Gordo's fault of course but mine for being an idiot and simply trying to do too much training for too long and not listening to my body, a hard lesson to learn but learn it I did - eventually! Gordo did however provide me with a couple of gems of training guidance which I have not forgotten and which are particularly relavent to the way I am training at the moment. The first one was that your fitness is not primarily influenced by your overall training volume but is the outcome of the quality and duration of your key sessions. The second piece of guidance was that you should try to avoid the grey zone, that intensity of training that it is easy to do a lot of, that doesn't really do you much harm but that doesn't really illicit much improvement either. For the grey zone in this post I am talking about HR Zone 3 on the table below - in yellow just to confuse. As my racing season approaches I have spent some time in the last few days analysing my January training a bit more closely than I have in the past and also comparing it to last year. So rather than waste the effort I thought I would share it on the blog. 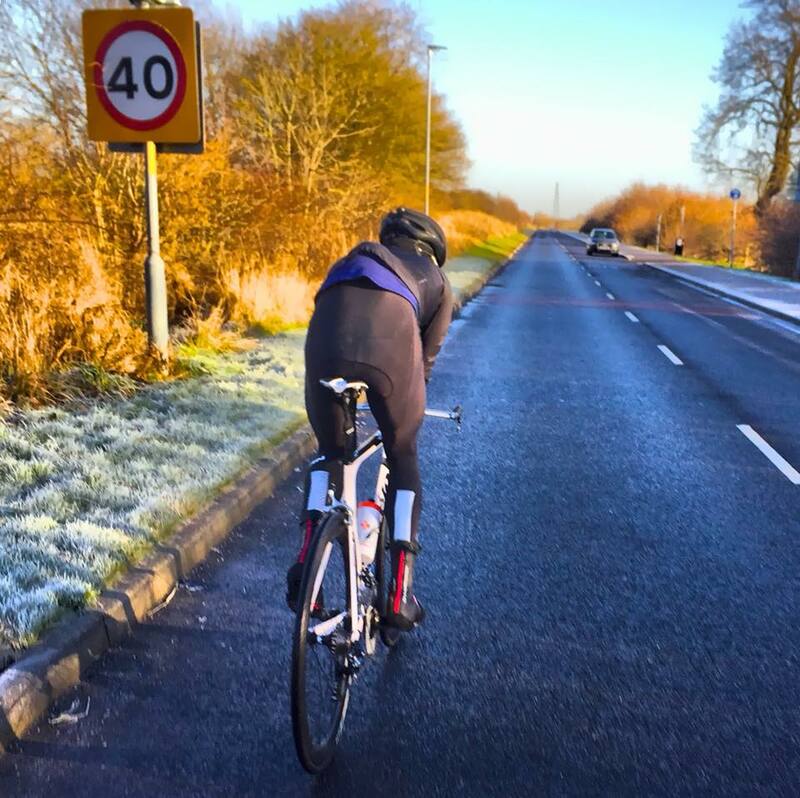 My recent post on the type of training an elite rider does in the winter proved to be quite popular 7 Winter Days. In that post I touched on what my winter training strategy was - basically hold the wheel of my son and coach Jack. I have also previously posted on fitness, here Simple Steps and diet and nutrition here Weight although to be clear I am not a coach or physiologist, I am a sports sociologist so when it comes to training advice I rely on Jack to keep me right, you can contact Jack for training advice at jack@neprocycling.com but as you might expect with a background in academic research I also like do things in training that are evidence based and the product of recently published, peer reviewed academic research. Infographicfrom YLM - based on research carried out in 2014 illustrating that a polarised approach is more effective than, high volume training or threshold training. 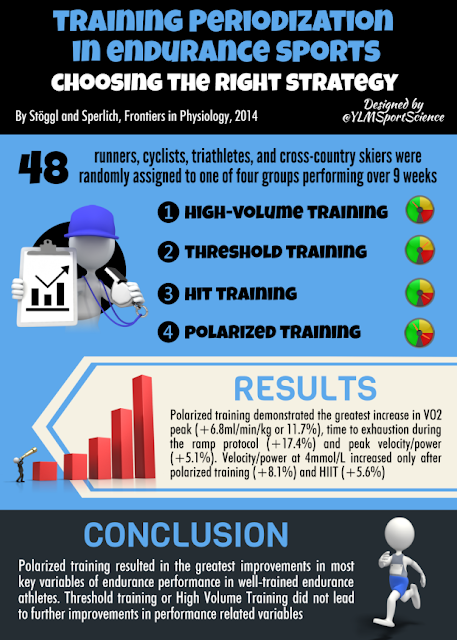 There is a lot of information out there on a polarised approach to training, the following link to Road Cycling UK explains it well Polarised and I particularly like this one from Phil Wilks of his own experience Polarised experience but for the purposes of this post and how I have approached it in practice is to keep things very simple by just minimising the amount of time spent riding in Z3 the grey area. (or yellow on the table above) by increasing the amount of time in Z4/Z5. In practice this means make the hard rides hard with a lot of Z4 or or even very hard Z5 and the easy rides very short and very easy Z1/Z2 - simples. I should say at this point that my approach to training in January has not just been a case of pressing harder on the pedals for longer. I have been doing varied race specific efforts which got harder as the month progressed, sometimes solo, sometimes with a group and often just by simply trying to hang on to Jack's wheel while he did his efforts. That feeling of relief when you are just about to get dropped and the level crossing gates close. To illustrate the difference a polarised approach has made I have included using some numbers and screenshots from my Strava below. Last year my early season focus was the Tour ta Malta in April TtM which was a good early season objective and one which I was really motivated to train hard for, so my perception of last January was that I had trained really hard, turns out I hadn't - certainly not in comparison to this January anyway. Before looking at the numbers a quick explanation of the jargon. 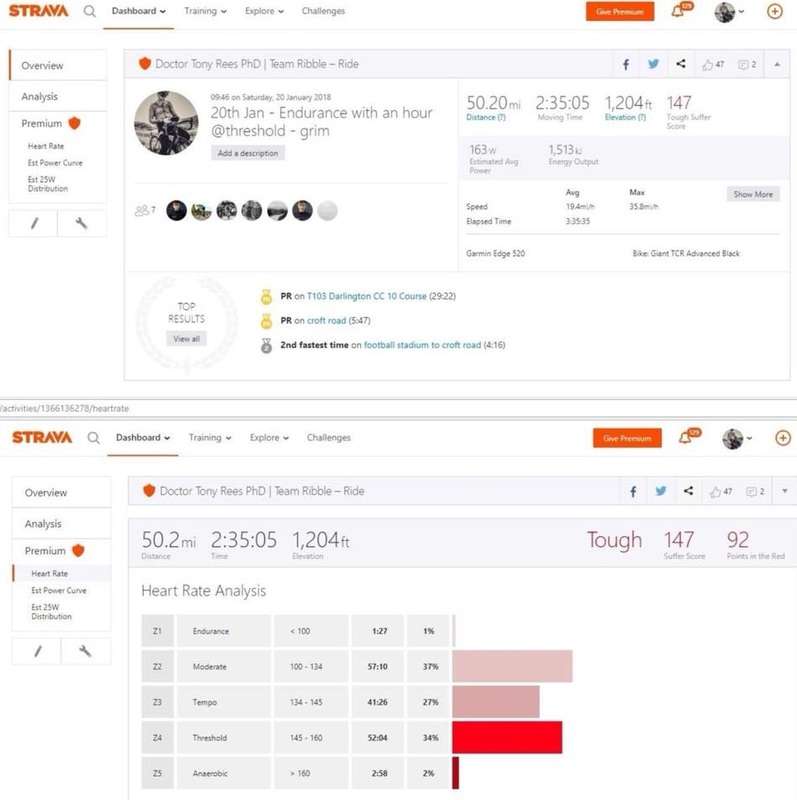 The Strava Suffer Score is a Premium feature (you have to pay for it) and is an analysis of your heart rate data based on your own custom heart rate zones. By tracking your HR throughout your ride relative to your maximum HR a value is attached to show exactly how hard you have worked. The more time spent in the higher red Zones 4 and 5 and the longer you ride, the higher the suffer score. 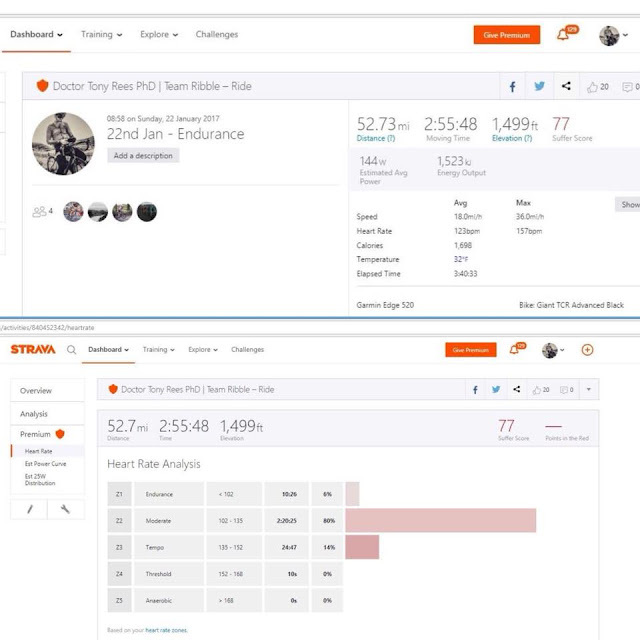 The Strava suffer score is based on well established science and is inspired by the TRIMP concept (TRaining IMPulse) developed by Doctor Eric Banister back in 1991. So when I compared January 17 to this January the time spent riding and the overall mileage are pretty similar, but this January has been much tougher than last January and the Suffer Score is significantly higher because I adopted a much more polarised approach, hard or easy - not much in between. When I looked at the amount of time spent I had spent in Z4/Z5 this January the difference was pretty significant to say the least. 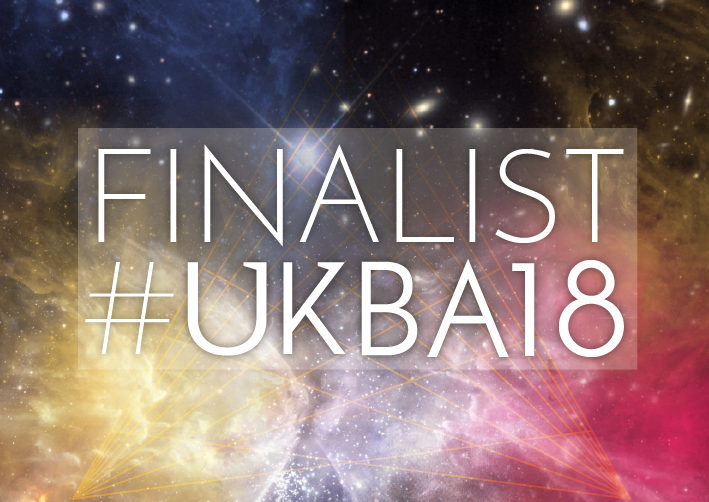 Now I might have a PhD but I am happy to admit that I am not that great with sums so I have had my calculations checked and double checked - partly because I couldnt quite believe it either ! Why is the Z4/Z5 percentage increase so massive ? Here are a couple of examples of the difference in Suffer Score between two similar rides when the amount of time in the GREY zone (Z2/Z3) is reduced. 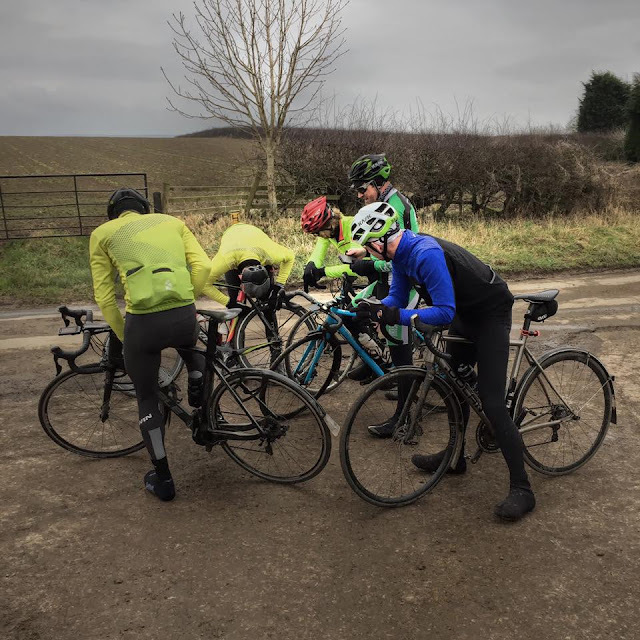 Below a 52.7 mile ride from the 22nd of January 2017 in a small group and fairly typical of my long rides last winter, with way too much time spent in the 'grey' zone. It didn't do me any harm but with the benefit of hindsight it probably didn't do me that much good either. Suffer Score 77, time in Z2/Z3 - 2 hours 45 minutes, time in Z4/5 - 10 seconds ! Below a very similar 50 mile ride from the 20th January 2018 with a similar sized group. Suffer Score 147, time in Z2/3 - 1 hour 38 minutes, time in Z4/5 - 55 minutes. No surprise that I described it as grim but you know what they say 'it doesn't have to be fun to fun' and I am certain it was much more beneficial and specific to the demands of my upcoming races Age Group Racing. Probably no surprise that the following day I just rode gently to the cafe. Below - My winter training group and a bit of a mudguard issue for my team mate Will Corbett from Team Ribble and after being dropped on a big hill another opportunity for me to drag myself back to the group. 1. Train with others if you can, ideally with the fittest people you know. Its easier to get into Z4/Z5 if you are desperately trying to hold the wheel of fitter/younger/more experienced riders. 2. Leave your ego at home and accept that you will be dropped you will get used to it - I have. 3. If you are fortunate enough to have more than one training option - choose the hardest one. 4. Train hard - recover - repeat. 5. Drink a lot of coffee. Below: Actual footage shot today of me being dropped again (04.02.18). Video was taken with the in-built camera in the X5Evo smart cycling computer from Xplova that Ribble Pro Cycling are fortunate to be using this season. Racing starts for me this month and my early season priority race is the four stage LVRC Tour of the Abberleys in Worcestershire over the bank holiday weekend 5th - 7th May, hopefully my January suffering will result in some decent form by then. worked at the French Institute of Sport as a sports scientist. He is currently employed as the scientific advisor at AS Monaco Football Club, his role there is to provide monitoring, training, recovery and rehabilitation advice to improve the performance of the team.